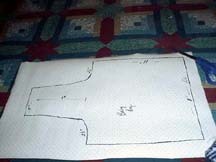 Step one: Draw your pattern. 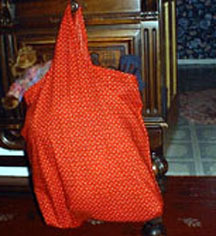 The bag is 11" square for the small size or 22"square for the large size. The handle is 4" wide and 7" long for small bag and 12" large bag, making the total length of the bag 18"sm./ 34" lg.. I like to place the bottom of the bag on the fold of the fabric. 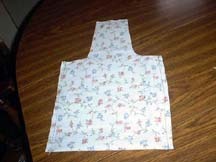 Step: 2 Sew fabric with right side together, along the sides and the top of the handle using 1/4" seams. 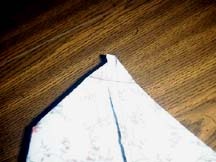 Step 3:Open up the bottom of the bag a bit and fold the corners over on themselves. Stitch a 1" seam diagonally acrossed the corner to form the bottom of the bag. This gives it depth. Step 4:Fold under the top of the bag and the sides of the handle 1/8" then 1/8" again to form a nice finished edge and stitch along the fold. Turn back right side out and give it a nice pressing! 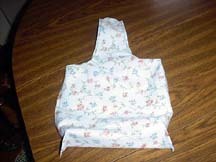 I would say you could adjust the size of this bag according to the fabric scraps you have available. I'm thinking I might just make myself a nice, big denium one to carry my craft projects in! Have fun and I hope you bless many children with this project!! !